The Eo-Alpine high-pressure belt in the Austroalpine nappes consists of pre-Mesozoic basement rocks overprinted by eclogite-facies metamorphism during the Late Cretaceous. Parts of this basement were already eclogitized during the Variscan orogeny. 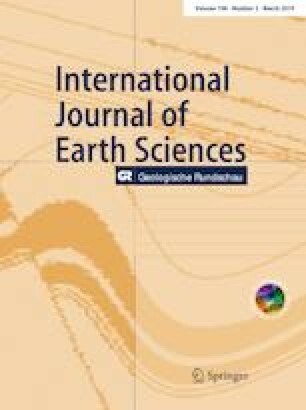 Lu–Hf geochronology allowed to identify two high-pressure events in an eclogite body in the Schobergruppe, an Austroalpine basement complex south of the Tauern Window. Two samples from closely neighboring outcrops were studied. Both contain two garnet generations. In one sample, PRI3, garnet belongs almost exclusively to the younger (Alpine) generation with only rare preservation of relic cores. In the other sample, PRI4, Variscan garnet is merely coated by a thin rim of the second, Alpine generation, which is in equilibrium with the high-pressure matrix assemblage. In PRI3, two-point garnet-whole rock ages scatter between ~ 97 and ~ 104 Ma, reflecting Alpine garnet growth with minor contamination by a Variscan component. In PRI4, two-point isochrons yield ages between ~ 300 and ~ 313 Ma. The limited spread in these ages suggests minor contamination by Alpine garnet rims. We propose 97 Ma as the maximum age for Alpine metamorphism, which is close to previously determined ages from other parts of the high-pressure belt, and 313 Ma as a minimum age for Variscan metamorphism. Thermodynamic modelling infers that eclogite-facies conditions were reached in both events; during the Late Cretaceous, these were ca. 1.9 GPa/650 °C. Variscan high-pressure conditions in PRI4 are inferred from the amount of garnet in the sample, which indicates at least 1.6 GPa. We propose that the occurrence of Alpine versus Variscan garnet in eclogites depends on the intensity of Variscan and post-Variscan retrogression: the more prograde, Variscan garnet was removed during retrogression, the more garnet grew during the Alpine cycle. Careful reviews by Franz Neubauer and Bernhard Schulz are gratefully acknowledged. Wolf-Christian Dullo is thanked for editorial handling. Supported by German Science Foundation (DFG) Grant No. FR700/17 to N. Froitzheim. This is contribution no. 58 of the Bonn LA-ICPMS lab.